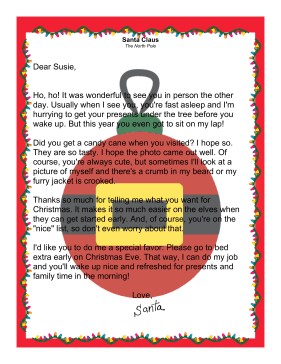 Whether Santa met the child in a mall, shopping center, school, store, city event, or any other location, this broad letter lets the Big Guy mention the in-person meeting while wishing the child a Merry Christmas. Ho, ho! It was wonderful to see you in person the other day. Usually when I see you, you're fast asleep and I'm hurrying to get your presents under the tree before you wake up. But this year you even got to sit on my lap! Did you get a candy cane when you visited? I hope so. They are so tasty. I hope the photo came out well. Of course, you're always cute, but sometimes I'll look at a picture of myself and there's a crumb in my beard or my furry jacket is crooked. Thanks so much for telling me what you want for Christmas. It makes it so much easier on the elves when they can get started early. And, of course, you're on the "nice" list, so don't even worry about that. I'd like you to do me a special favor: Please go to bed extra early on Christmas Eve. That way, I can do my job and you'll wake up nice and refreshed for presents and family time in the morning!